I was invited to join the "Get your Chef on" challenge hosted by Jenn at Four Marrs and One Venus and Julie at White Lights on Wednesday. Both are great bloggers and wonderful ladies, you should go check out their sites. In this first challenge we are to post a never before posted recipe involving lemons. So for this challenge I decided to find a new recipe, not my own, and share the spotlight with another blog at the same time. I have seen this recipe on Pinterest several times and just had to give it a try. I love lemon and blueberries, especially together. This recipe is from Jessica over at Portuguese Girl Cooks and you should really check out her blog too, she is AMAZING! Hi Jessica! Thanks for sharing this wonderful recipe. Preheat oven to 350 degrees. Spray a 9 x 5 inch loaf pan with cooking spray and set aside. In the bowl of a stand mixer cream the butter, sugar and lemon zest until light and fluffy, about 3 minutes. Add eggs one at a time and mix until fully incorporated after each egg, scraping down the sides as you go. Add the milk and vanilla to the batter and mix until incorporated. Add the dry ingredients and mix until just incorporated, scraping down the sides as you go. Toss clean blueberries with 1 tsp. of flour until coated then gently fold into batter. Pour the batter into the prepared pan and bake for 50 - 55 minutes. A toothpick inserted into the center should come out clean. Cool bread in baking pan a few minutes then transfer to a wire rack to cool. While bread is baking, make the lemon syrup. In a small saucepan heat the sugar and lemon juice. Bring to a boil and cook until all the sugar is dissolved and the syrup is slightly thickened. About 2 minutes. Be very careful this will burn if unattended. Using a skewer, poke holes all over the top of the bread, the syrup will fill the holes and make the bread moist so don't be shy when poking the holes. After you poke the holes brush the bread with all the syrup. It took me a few times going over the bread to use up the syrup. Allow the bread to cool completely, a couple of hours, before glazing. In a small bowl whisk the powdered sugar and lemon juice until it is the right consistency. I added the lemon juice 1 Tbs. at a time until I achieved the right consistency. Pour glaze over the top of the bread (I kept mine on a wire cooling rack over a parchment lined cookie sheet for easy clean up). Once the glaze has set up, about 1 hour, slice and serve. Oh-ooey! Gooey! Goodness! Michelle loving this bread..and LOVE the fact that you punch holes to get that yumminess down into the bread! 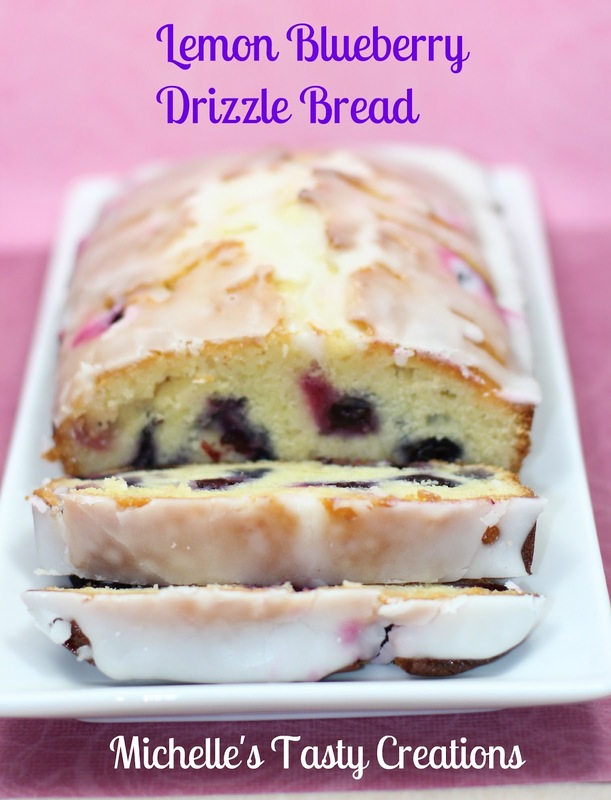 I can only imagine how Moist this Lemon-Blueberry loaf is! Super good! We are a bread family over here...I get my boys would go Crazy over this! Thanks so much for playing along in the GYCO Challenge! I love everything you Bake! Thanks Jen, It was Super moist and delicious! I always love a challenge so that I don't use the same recipe over and over. I'll definitely be back for the next challenge. Mmmmm...lemony blueberry goodness for my tummy! This bread is going to amazing for breakfast later this week. :) I love having an excuse to try out and find new recipe too. Thank you so much for joining us Michelle. We can't wait to have you back for round 2 in July. oh man that looks amazing! The glaze just makes it look over the top delicious. thanks for sharing this any your other recipes on foodie friday. This looks delicious and I'm a fan of lemon and blueberries! Oh! this one looks delicious! 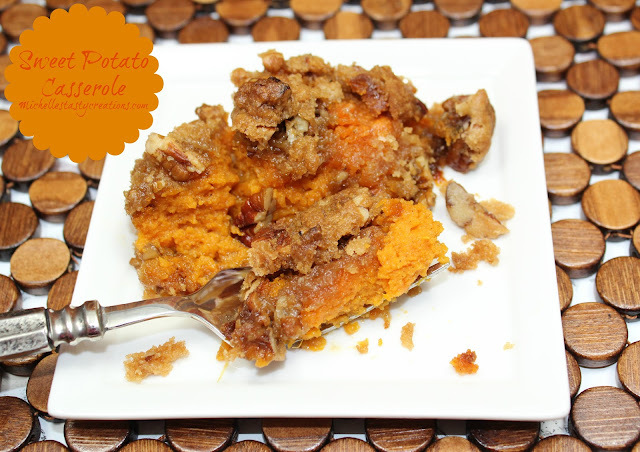 Thanks for joining Southern Sundays with this wonderful recipe! 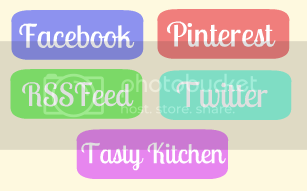 I'll be announcing the featured recipes next week. Hope to see you at the next party with another great item! 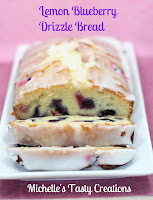 I adore lemon blueberry bread. I have a version that uses vanilla yogurt that is so good. Thanks so much for sharing on Tout It Tuesday! Nom nom nom! I love lemon.. and I love anything with a drizzle or glaze. OH my mouth is watering! Thanks for linking up last week Michelle! You are being featured tonight :) Check it out! Oh, this would be a hit with my family. We love fruity type breakfast or dessert breads like this one. Looks like it would be wonderful with a cold glass of milk or steamy cup of coffee. Thanks for sharing the recipe! I'm going to pin this later. I love lemon and blueberry! Thanks for sharing at our HAndmade Tuesdays party! In my mouth now! Oh wow this looks so good! Thanks for sharing at You're Gonna Love It Tuesday! Oh that is a great idea to poke holes into the bread for the syrup to pool up!!! YUM!!!! I'm in LOVE!!!! Lemon & Blueberries.... HEAVEN!!! I'm looking forward to seeing what you link up this evening! Your cake looks amazing! Found you hopping around! Love for you to follow back when you get a chance! Baking this for my husband to take to the office tomorrow and it smells heavenly! There is too much goodness in one place! I just went through 3 amazing recipes of yours and now there's another! Definitely trying this!